Due to the heavy monsoon rains that have plagued Sri Lanka over the past week, severe flooding and mudslides in the Western and Southern regions have claimed at least 188 lives, displacing a further 112,000 and directly affecting more than 500,000 according to the estimates of Disaster Management Centre of Sri Lanka (DMC). The monsoon rains are the the worst to hit Sri Lanka since 2003. They follow two months of severe drought. The district of Matara has been particularly affected. Finance Minister Mangala Samaraweera said that there were still pockets where people were marooned, and rescue work was continuing. The nearby Ratnapura district, 63 miles southeast of the capital, Colombo, has experienced the highest death count of any area to date, with 79 deaths. The southern coastal city of Galle has seen 223 millimeters (8.78 inches) of rainfall over the past three days, and Ratnapura, further inland, has experienced 453 millimeters (17.8 inches) of rain over the same period. 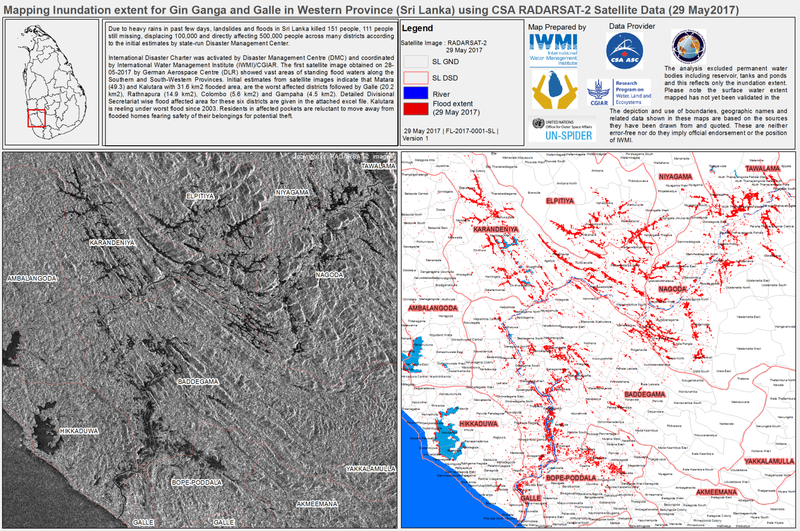 The International Disaster Charter was activated on 26 May 2017 by the United States Geological Survey (USGS) on behalf of the Disaster Management Centre of Sri Lanka. 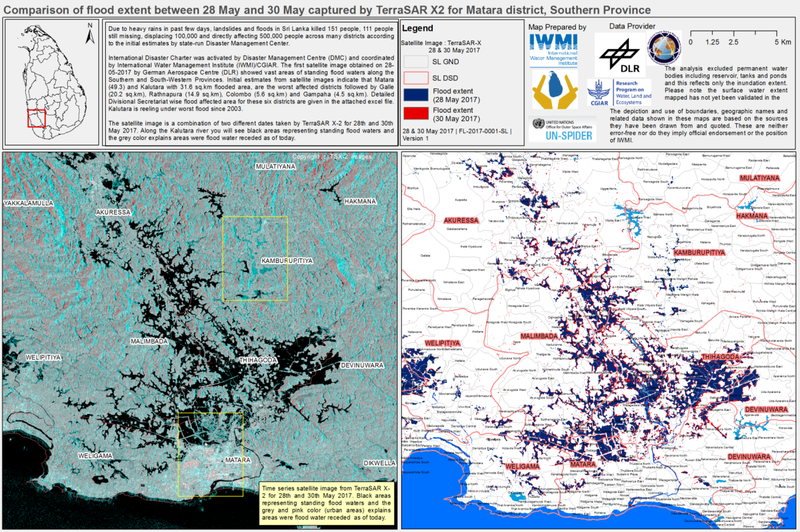 The International Water Management Institute (IWMI/CGIAR) act as project coordinator for this activation and has generated a number of maps based on TerraSAR-X, Sentinel-2 and RADARSAT-2 data. More information on this Charter activation can be found here. 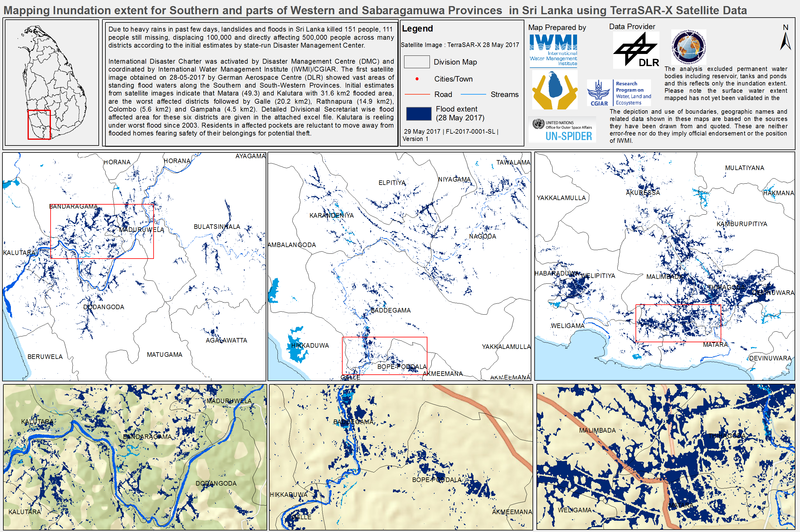 The latest Sri Lanka Flood situation report (29/05/2017) using TerraSAR-X satellite data and publicly available sources (IWMI) is available here. Additional update are available from Reliefweb here. The latest updates from the UN Resident Coordinator in Sri Lanka can be retrieved here. Mapping products developed by the Copernicus Emergency Mapping Service are available here.